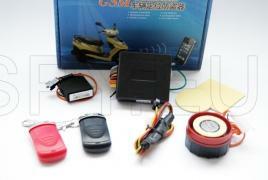 The tracker is suitable for any moped, scooter and motorbike with battery voltage 12V. It can act as an alarm system to prevent the thief to start the engine of the vehicle and to trigger the powerful 125 dB alarm, but if this protection is overcome you can find the location using the aGPS system. The device has a management module which hosts the alarm, tracker, headlights, relays, etc. With the remote control, you can turn the alarm on and off, to adjust the vibration sensor, to stop the power supply or to get the bike to show you its location with sound and light signals. For your convenience we included in the kit two remotes. Vehicle tracking is done either by getting a link to the location or via the free web-based platform.